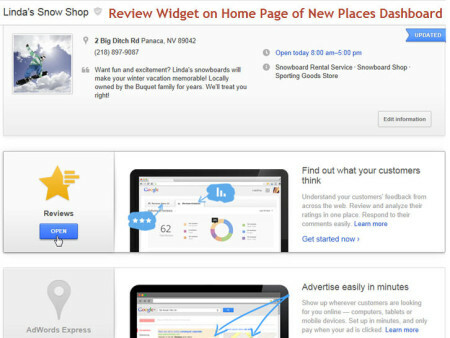 Reviews are already a huge factor when it comes to helping businesses stand out and succeed online, and if there needs to be a definite sign to signal the value of reviews in the future, it has to be Google’s recent announcement of their Reviews Dashboard to help local merchants monitor reviews from across the web. But, alas, Google has disappointed with this product. In my humble opinion, this product is nothing but a shinier interface to display data that Google already had and were collecting over time. Google seems to have adopted a model of “if we find it, we’ll report it” when it comes to monitoring reviews. This means that, unless they find a review (which may take days, weeks or months), you’ll never see it in the dashboard. Anyone who’s been doing serious reputation monitoring understands that unless you’re able to respond back to complaints in a speedy manner, you stand to potentially drive away new customers. This dashboard from Google isn’t about speed, it’s just about showing random reviews as and when Google’s crawler finds them. Google cannot identify reviews unless they are properly marked up with schema. This means that, they cannot identify almost half of the more popular review sites. For instance, Google would never be able to find reviews on Yahoo Local, TripAdvisor or Kudzu. “Reviews From Around The Web”, which is the section where the non-Google reviews are displayed have incomplete text in most cases, this is a huge problem and one needs to really click through and go read the full review from the site. This is not a biggie, but G is really not saving me time; I still need to individually claim listings in each site in order to respond back to reviews. This in my opinion is another major reason why I wouldn’t use Google as my only staple for review monitoring, they do not notify me by email when they receive new reviews, and expect me to login to the dashboard every day to check for reviews. This is such a simple thing that Google could have done and they chose not to. In conclusion, though the Google Review Dashboard is a nifty feature, it just looks like a poorly done rehash of data that Google already had and is not going to add all that much value to local reputation monitoring. Image credit goes to the Local Search Forum.